I just thought the joke is great and unexpected. It reflects my vision as a director because I wanted to create the feel of a busy office without needing one, and create the world the script needed on a budget. My producer found the actor for the office worker role last minute, through an agency friend. The nerd character responded to one of my ads and had a really funny reel. I was putting out ads and trying to find office spaces for rent online. When most people realized I was shooting a video, their modest office rental skyrocketed to a huge location fee, but we finally found an office rental that was decent and they were cool with us shooting there. I DP my spots, and we put out ads for our crew. I also had worked with some of them in the past, or had gotten a referral. 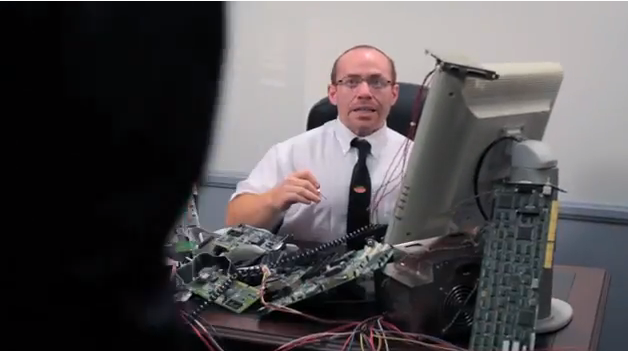 Shooting was great, except that we didn't make our art for the broken computer big enough the first time around. So we had to go back and get a pickup shot one night, and that was a pain, but totally worth it. Editing took a bit longer than expected because of the pickup, and my work schedule. I used Final Cut and After Effects. I always wish I could afford bigger locations afterward but you do what you can with what you have and I'm happy for now.